24. Star Wars. Harry Potter. Batman. All successful narrative worlds expanding across different media and platforms. What do these new forms of storytelling, product and service design and branding tell us about future convergence of culture and technology? These and other questions of importance to media innovators were addressed this week at an sLab Explorations workshop with Dr. Carlos Scolari on transmedia storytelling. It was the first in a two-part workshop. Dr. Scolari presented the different concepts around the “transmedia storytelling” idea, such as cross-media, multiple platforms, hybrid media, intertextual commodity, transmedial worlds, transmedial interactions, intermedia, multimodality, and media convergence. The dictionary is open and we must learn how to read it. Meanwhile, the stories are blasting and expanding through different screens, surfaces and spaces. Dr. Scolari’s powerpoint presentation is available on Slideshare at http://tinyurl.com/lr73bs or watch it below. Next week we present part two of this workshop where we invite you to expand a fictional text and reflect on the process of transmedia story telling. Even if you missed the first event, you’ll find the second of value. If you’re interested in participating and would like the three stories that we’ll work with in our next session, you can email Dr. Scolari at carlos.scolari@gmail.com. And mark your calendar for this second installation on Transmedia Storytelling, taking place Tuesday July 14, 3–5pm at the Strategic Innovation Lab (sLab), Ontario College of Art & Design (Room 600, 100 McCaul Street). If you can’t make this event there will be other “Exploration” workshops in this series, which will be announced and listed on the MaRS site. 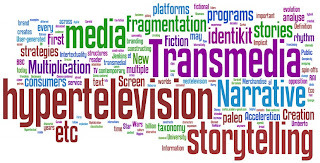 Transmedia storytelling Narrative strategies, fictional worlds and branding in contemporary media production. View more presentations from cscolari.